Find hotel near Carman Golf & Curling Clu .. 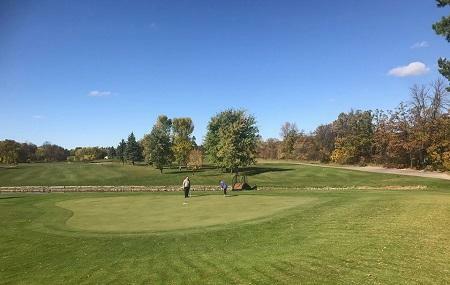 The Carman Golf and Curling Club on the eastern edge of Pembina Valley is a perfect getaway to enjoy golfing and socializing in the countryside. The 18 hole golf course of Carman Golf and Curling Club is perfect for all skill groups with its moderately gentle holes, water hazards, rolling greens and tight fairways. No matter whether you are a newbie or have been playing for years, the club will welcome everyone heartily to its rustic facility. The Curling Club also hosts a number of training programs and tournaments to engage people in the game of Curling. The McGee’s Family Restaurant overlooking the stunning golf course offers delectable food and drinks and hosts a number of social events such as weddings in its vintage backdrop. Christmas, Baby Shower, Corporate Meetings too can be organized here. Greens were great! Course in really good shape. Staff needs some work with people skills. I absolutely love this course, well maintained and a tranquil setting. friendly staff. Great place for breakfast at a reasonable price. I golf here every chance I get! On Sunday 7 deer ran out in front of us on #9, it was great to see. Not much of a golfer myself but the food here makes my tongue feel like its on cloud nine.